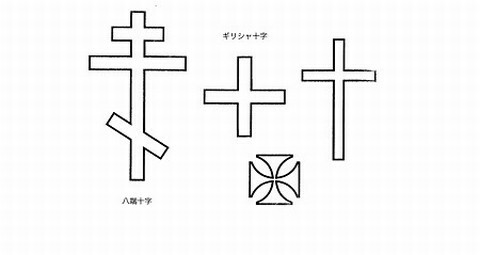 There are actually many kinds of crosses, and each one is used differently. Among them, I will introduce three representative crosses that are used in Christianity. A representative cross that is frequently used in Catholic and Protestant, which has the character that the vertical stick is longer than the horizontal one. It is also known as a Roman Cross. Originally, the cross was a tool used when Christ was crucified and then it became a symbol that strengthens religious implications, so in that sense this type of cross can be called the most orthodox one. It is not only used in Catholic, Protestant but also frequently in Eastern Orthodox Church, which is regarded as the most common cross along with the Latin Cross. It is characteristic that the lengths of the vertical stick and the horizontal stick are the same and intersecting in the middle. In addition to the use of religious implications, this cross is very common to be used in emblems and national flags. Switzerland's flag is famous for adopting this cross. It is the cross most commonly used the Eastern Orthodox Churches, consisting of four sticks, one vertical stick and three horizontal sticks. It is said that Jesus's charge is described on the short horizontal stick added over the horizontal stick of Latin Cross and the remaining two sticks represent the a footrest of the gallows. By the way, we often call the cross necklace Rosario, but this is a word only used in Catholic. Eight-pointed Cross necklace is not called Rosario, so please be careful.